The best hostel I have stayed in, and by far the most difficult to leave. Felt like I was staying with friends and family. Such an amazing stay. This is the best hostel experience I’ve ever had. It felt like staying with family. Thank you, Josko, for such an amazing stay! This hostel is perfect! Right in walking distance of the old town, the viewpoints and tons of bars and restaurants. Joško is the best host you could ask for and did everything to make my stay as great as it was. If you want an amazing atmosphere in a perfect spot in Split then this is the place for you! This is the best hostel!! Such a cool little space, everyone hangs out together. It’s awesome! Josko is great, he took us to some waterfalls and up to a castle all in his car. I so recommend going here! If you want to have one of best experiences of your life, make friends and get to know split, please, STAY THERE! I’ve traveled a lot and I can say this was one of the best experiences I have ever had. Super well located, clean, comfy beds and the best host ever! You fell like home and never want to leave. Josko took us to krka national park and it was amazing! 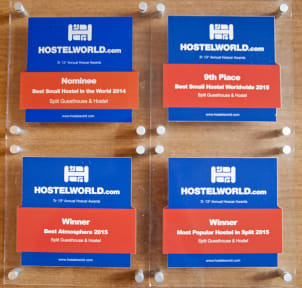 The hostel is a fantastic place to stay due to josko (the owner) and the atmosphere he creates in the hostel. It is fantastic for meeting people and has a fun atmosphere from entering. Josko himself goes the extra mile for everyone and has a great sense of humour (laughing off the fact someone cracked an egg under my pillow). fantastic trips to the local national park can be booked through the hostel which are amazing and great value. One of the best hostels I’ve ever stayed in. Great hostel! Very warm, social atmosphere and easy to meet other people! In a nice part of split, a few minutes walk away from the old town but not too chaotic when you want a rest. Very clean with great kitchen and spacious/comfortable rooms! Joško is an absolute legend and offers day trips to Krka falls/Klis fortress for the hostel crew which is not only beautiful, but also a very entertaining day out at a good price! Everything about this hostel is perfect! Will be back :) Thanks Joško!!!!!! The owner/host is amazing, the location of this hostel is great and the place is clean and spacious. The only disadvantage is that the common room area is rather small and right outside the rooms - so it can get quite noisy when people are partying at night and you may not get a great sleep. The rest of it was great and I recommend this hostel!